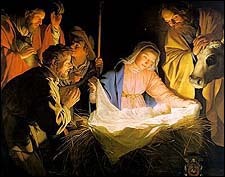 Gerard (Gerrit) van Honthorst (1590�1656), Adoration of the Shepherds (Die Anbetung der Hirten, Adorazione dei Pastori, 1622). 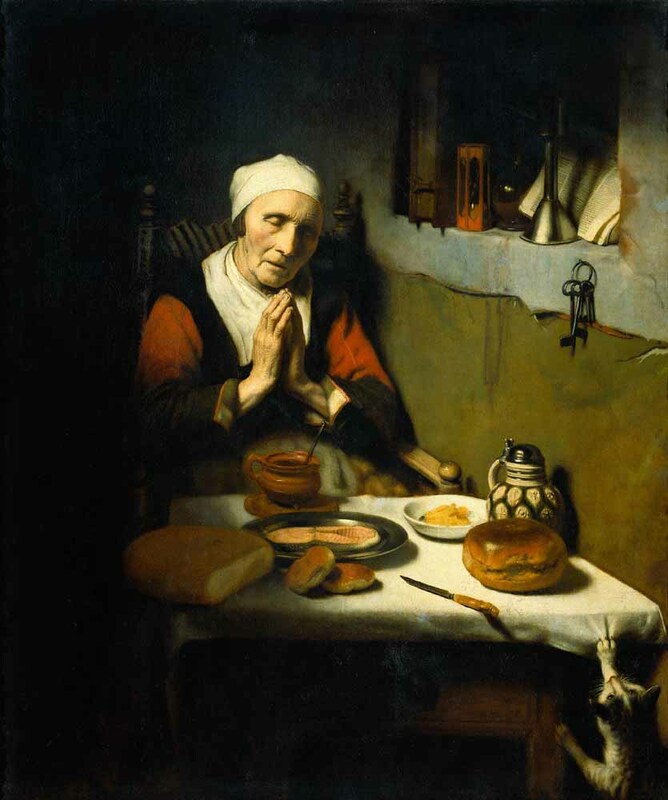 164 x 190 cm, Wallraf-Richartz-Museum, Cologne. Larger image. "Fear not! Do not be afraid!" The angel spoke these words to Zachariah, to Mary, to Joseph, and finally to a group of shepherds on a hillside near Bethlehem. Fear has a way of tying our stomachs up in knots, paralyzing our thinking, inducing panic. Fear, and its cousin worry, can capture our hearts when we see ourselves caught in a vortex of disasters beyond our control. During this Christmas 2008 the entire world is caught in the grip of an economic down-spiral. Houses are being foreclosed on. People are losing jobs. Factories are closing. Food costs in some countries have risen 25%. More and more you glimpse a kind of bleak fear in people's eyes. Will I lose my house? My job? What will become of us if this recession deepens into a depression? How will I feed my family? Fear can grip us, choke all faith out of our hearts. Fear also drives economic depression. Fear causes companies to contract and people to stop buying. It causes runs on banks and panic on Wall Street. FDR reminded a nation that fear itself constitutes a large part of the problems we face. It was as true in 1933 as it was on the first Christmas. For on that first Christmas, the world was in desperate times, too. A census is being conducted in order to raise already high taxes. Murderous, paranoid Herod the Great is king of the Jews. It is winter on Bethlehem's hillsides — and cold. Inside a cave in the town sit a poverty-stricken carpenter and his young wife — far from home, chilled to the bone. She is in labor. Her child will be born in a stable, of all places. Why is it like this? she may have asked. Fear not. 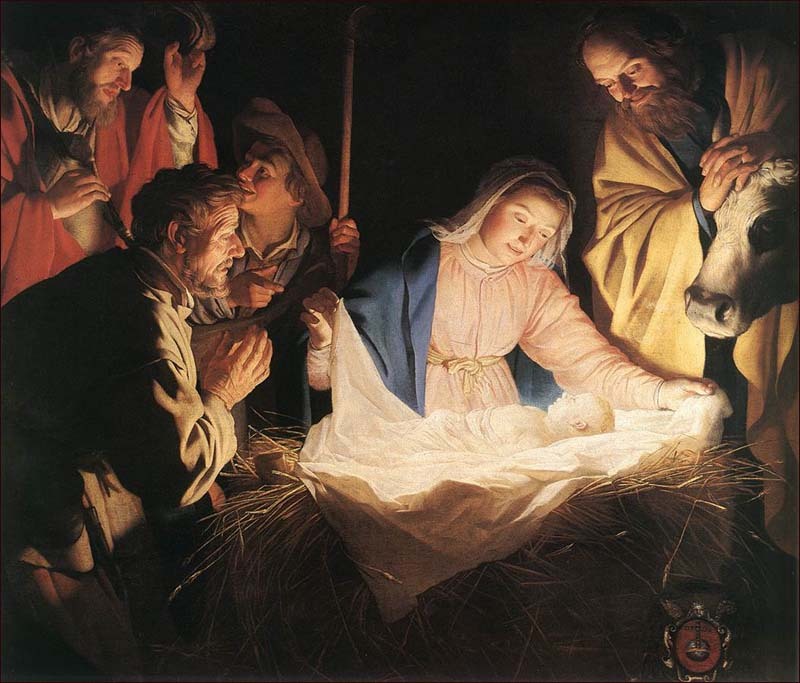 The shepherds' fear is turned to joy as they hear news that a Savior is born. The Messiah! In Bethlehem, the city of David himself! And so they run down the hillsides into the town and hurry from stable to stable until they find the Child in the manger, just as they have been told. Tucked in that manger, wrapped in swaddling clothes against the cold, is the Savior himself. 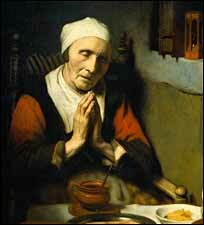 Nicolaes Maes (Dutch painter, 1634-1693), detail of "Old Woman at Prayer," known as "Prayer without End" (1656), oil on canvas, 134 x 113 cm, Rijksmuseum, Amsterdam. Larger image. A Savior comes to rescue people in danger, preserve those who are threatened by harm, and protect his people from the troubles that surround them. That's what saviors do! That's what Jesus came to do for us. Our world doesn't know. They think that Christmas is about gifts under a tree and a spirit of good cheer, with Christmas dinner and family around the table. But as good as all that may be, it isn't nearly as good as the Real Christmas. The Real Christmas message is this: God has sent a Savior for you. To save you from your sins and to help you in this life — to lift your burden and ease your fears. That's it! A Savior who is Christ the Lord — God himself! "Fear not ... for a Savior is born to you — Christ the Lord!" 4. Franklin Delano Roosevelt, First Inaugural Address, Washington D.C., March 4, 1933.